What would you do if you lived in one of the toughest inner-city neighborhoods in Houston and knew that moving away was not an option? Those who live in tough urban neighborhoods have the same, albeit more intense, concerns for their safety as those who live in suburbia. The difference is that the dangers in urban areas are often more obvious — things like abandoned houses on overgrown lots, buildings tagged with graffiti, unemployed people hanging out on street corners, and more. This past weekend our missions ministry engaged in three service initiatives in Houston’s Third Ward in cooperation with our ministry partner Mike Malkemes of Generation One. As we drove from one project to another, Mike commented, “The more time I spend in the Third Ward the more I love it and the people who live here.” Mike’s words are indicative of a divine call to live out his faith in a hard place — a place from which many would prefer to escape. Mike and his wife Kenzie are committed to investing their lives in the Third Ward. They believe that this is the only way to effectively reach the generation of at-risk kids that first beckoned them to these tough streets. And because they live where they serve, they know both the problems and the potential of these kids and how to mobilize resources and partners to help them in their work. The fruit of their labor is becoming increasingly evident as the actual landscape of the Third Ward is changing because of their efforts to demolish crack houses and clean abandoned lots covered with urban debris. But even more important is how God is using them to sow the seeds of hope in soil packed hard by despair. Little by little, change is coming. Our team was privileged to lead a young boy to faith in Christ this past weekend, a reminder that change comes one life at a time. As I was leaving the familiar streets of the Third Ward, I drove past a group from one of the neighborhood churches. 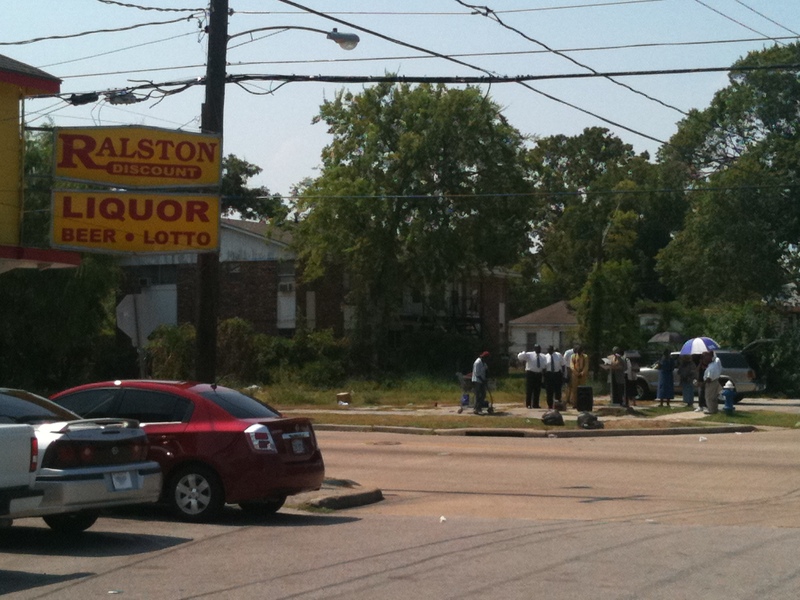 These folks were preaching and praying on a street corner across from a liquor store. I stopped to listen to the impassioned pleas of the street preacher while customers walked in and out of the liquor store. While I am not convinced that this is the most effective way to bring about change in the Third Ward, I do have lots of respect for the folks standing and preaching the gospel in triple-digit heat. Regardless of what we may think about them, they were undoubtedly motivated to do something to make a difference in their own community. It’s far too easy to sit at home and complain that the neighborhood is going to hell in a hand basket. However, it’s harder to get out into the streets and do something about it. So, kudos to the street preacher and those who stood with him. Like Mike and Kenzie, they too care about their neighbors and their neighborhood. Praise God for them. And Yes it may not be the “best” way to bring about change in the Third Ward, but it looks like they’d settle for just bringing change one soul at a time!